Human societies have always produced artefacts and events intended to stand out visually, to command visual attention. In describing the achievements of remarkable or unusual visibility, the archaeologies and ethnographies of visual conspicuousness have traditionally assumed cultural distance between the researcher and her subject such that the researcher ought to mistrust or resist her own evaluative sensibilities – rooted as they are in a different visual culture. 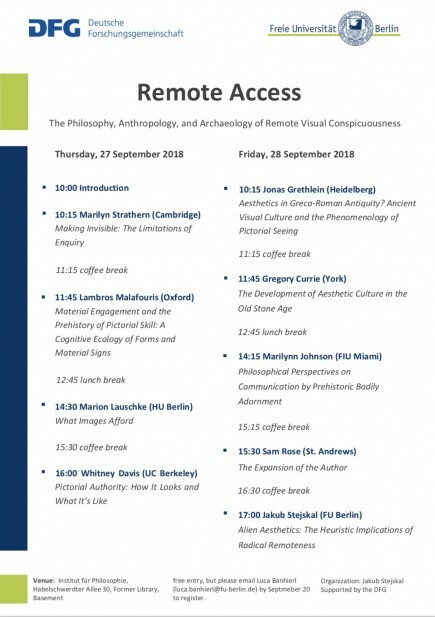 The conference will address the present standing of this heuristic stricture by discussing the procedures and theoretical underpinnings of reconstructing the visual conspicuousness or authority of artefacts from remote cultures. The conference is organized by Jakub Stejskal (jakub.stejskal@nullfu-berlin.de) and supported by the German Research Foundation (DFG). There are no registration fees, but please e-mail Luca Banhierl (luca.banhierl@nullfu-berlin.de) (best by September 20) to register.